If you have already reached the running level of a 5k run or followed the 5k running plan here, then you might be ready to tackle the next step – 10k. Once you’ve checked the local 10k races that are available in your area, then you just need a plan…. …here’s the way to do it! First of all, assess your level of experience how close you are to being running fit. If this is the first time you have run a 10k, then your aim will probably be just to get round the course. Equally, if you are experienced, then you’ll be more focused on achieving a better time than last time. This matters, because there is an easy way to build up to a 10k run – and there is a more complex way, which simply requires more time, focus and commitment, if you want to start to improve your times. It is wise in all cases, to assume the level of excitement that we start our training won’t be equal throughout! In other words, if we are going to succeed – and that means complete the training, then we are wise if we don’t bite off more than we can chew! So, if in doubt, opt for the easier option, you can always increase the training later if you want to. The next step is to plan your diary. And yes, this means, planning either your paper or electronic diary by setting appointments to go running. 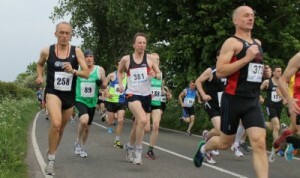 A 10k running plan is typically a 12 week programme. That means you need to be able to run every week – 3 times per week – for the next 12 weeks. So, if you have holiday or business trips planned, can you take your running shoes and keep jogging? You can do this if you plan. Equally, when are you going to run? In the morning or in the evening? Or lunch time? Which ever you choose, plan the event in your diary. Do it now. Here is the simple plan. This operates for 12 weeks (or just under 3 months) working back from the actual race day. Please note, the purpose of this plan is to slowly extend your range – but also to provide sufficient time to recover. Equally, the plan is designed to help you achieve a weekly distance. This means that if you run slightly shorter on some days but longer on others, that’s okay, so long as you are reaching the weekly target. Also, some weeks are designed to be reduced – in total distance and individual run. This is deliberate as it gives the body time to catch up. Hence, if you need extra time on any particular week, you can always swap these around. You should always use correct running shoes. After that, you can spend as much or as little as you want – so long as the shoes are comfortable and adequately protect your knees by containing sufficient cushion on the heel. Depending on the time of year, you will need more or less protective clothing. Once it gets icy, then running outside is hard and you may prefer to come in doors by joining a local gym. Also, if you are running in the dark or along roads then a reflective jacket is a wise precaution. However, if you stick to daylight and use cycle paths or pavements or canal routes, then shorts and a T Shirt of Polo shirt are sufficient. Often, you’ll see runners wearing a pair of gloves – which makes a surprising difference if it is cold. Now, if you have run a 10k before and want to go faster or better, then you can take the simple plan above and start to add extra trainings. These can consist of cross-training on your non-running days. Or, if you want to go further, short bursts of high speed running – repeated over and again. Here’s what is important. This addition running is not necessary to finishing the race. This, instead, is designed to help you run faster – if that’s what you want! Therefore, please feel free to either ignore it, adapt it – by making it simpler, or adopt it entirely. Essentially, you are training your body to run for shorter distances at a higher speed – but repeating frequently. You can add as much or as little of this ‘extra’ plan to your personal plan as you desire. Lastly, find a companion or fitness trainer that you can run with. Or at least, find a companion that you can share the race with – the more people you know in the race, the easier it becomes. This last point is probably the most important point when it comes to succeeding at your first 10k race. Lastly, telling friends and family that you are entering the race is a great way to put your goal out there. And, once you’ve told people, you then need to stick to your plan and do it!